At the top of your screen, go to the Products tab and click All Products. On the All Products tab, click Add Product. Note: Click Add more below main image to add up to 10 images. Click and drag images to rearrange them; the first becomes the main image. To delete an image, roll your cursor over it and click the trash can. Note: You can enter a Sale price now or later. On store's Shop page, the sales price displays next to marked-out regular price. By default, for new products the Collect taxes on this product check box is already selected. If you do not want to collect taxes on this product, clear the check box. 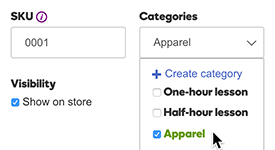 Use Categories to assign the product to an existing product category or to create a new one. By default, for new products the Show on store check box is already selected. This ensures that your new products appear in the store. Clear the check box to hide products not for sale, such as seasonal items. Once you finish adding a product, click Save or Save and Add Another. To return to the list of all your products, click the Products tab and select All Products. The All Products page also lets you update product listings, copy a product page to save time building a similar page, or delete pages you no longer need. 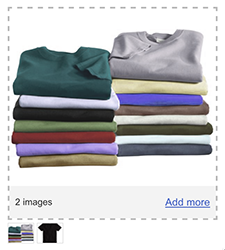 To add photos to your non-product pages, see Add Photos. Edit a product Click the pencil icon. Copy a product Click the copy icon to create a new product page with the same info. Then edit the product name, SKU, or replace image. Delete a product Click the trash can for the product you want to delete, or select the check boxes for several products and click Delete.